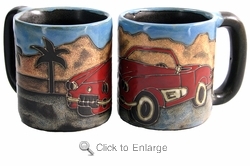 This Mara coffee mug shows a scene with a red sports car and a background of palm trees and sand dunes. You can almost feel the wind in your hair. A nice gift for a friend, who owns a sports car.